Perfect Party Pack is the ultimate hostess helper! Whip up five different A-list appetizers in a flash using items already in your fridge. 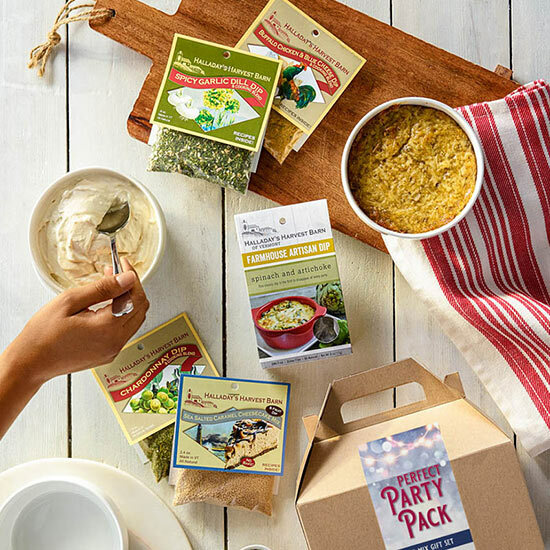 This set of dry mixes comes with multiple dip recipes for each packet, allowing you to customize your party menu. Add simple ingredients like cream cheese, mayo or Greek yogurt to the pre-packaged seasonings and stir. Dip flavors include: Sea Salted Caramel Cheesecake, Buffalo Chicken and Blue Cheese, Spinach and Artichoke, Spicy Garlic Dill and Chardonnay.